While it might indeed be inspired by NetEnt’s Gonzo’s Quest, Diego Fortune by Booongo is a different game, with different features and a different kind of fun. The 5 reels, 3 rows and 20 paylines game is only similar in terms of theme and design, but as the bonus features go, it’s a different style and gameplay. With an RTP of 96.85% and the added bonuses this game is going to be quite relaxing to play. Wild – wild symbols appear on the second and fourth reels and they can substitute all symbols except for the bonus and the scatter icons. Free Spins – three scatters will trigger the free spins bonus round in which you receive 15 free spins. Calendar coin – whenever this symbol appears on the reels it will be accumulated. When all the slots are filled they will trigger sticky reels and four re-spins. 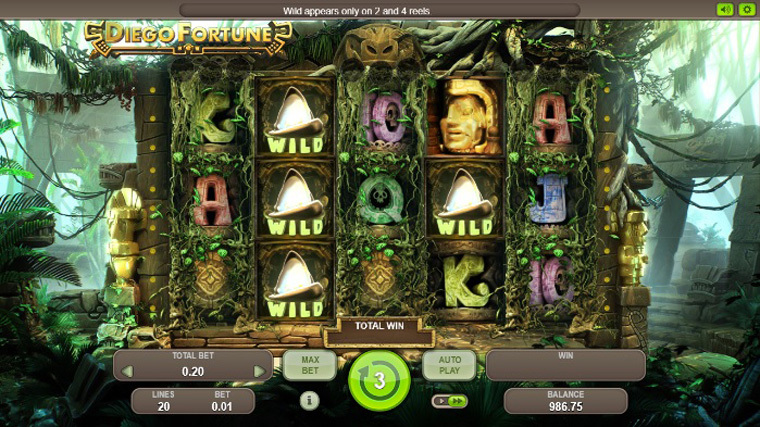 Bonus game – three bonus icons trigger the bonus game where you will need to fin hidden treasures.